ResearchUVA Generates Interest at State Higher Ed Conference | RESEARCHUVA, U.Va. OSP’s recent launch of the ePRF is an important deliverable in building out pre-award functionality in ResearchUVA. 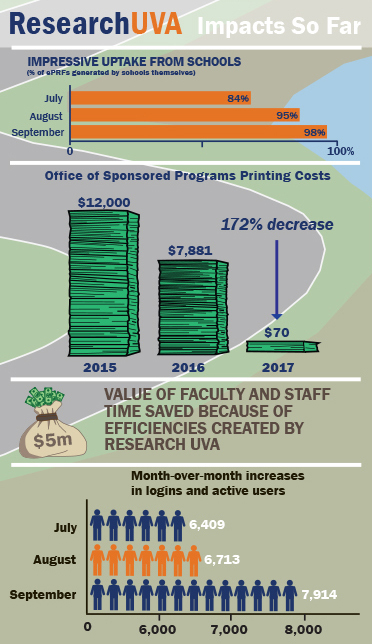 While UVA started later than many institutions in implementing a modern research administration system, what the University has today is the start of a next-generation piece of software, designed to meet the specific needs of multiple stakeholders and superior to what’s currently available in the marketplace. "Several people spoke about their organizations' decisions to spend a lot of money purchasing out-of-the-box solutions that are not delivering what they need them to deliver. Hearing these stories really validated our decision to build and not buy." "We chose not to purchase a system to avoid being constrained by vendor capabilities and the functionality these systems offered. We wanted a research administration solution that we can customize ourselves to meet our users’ specific needs and wants; something that can grow with us." When Vonda and Chris shared that ResearchUVA started as an inexpensive, quick proof of concept project, with only three team members, it raised some eyebrows. People were interested in hearing how the scope of ResearchUVA has changed over time, with the system now at the center of UVA’s strategic goals relating to research. Vonda and Chris also talked a lot about the importance of the ResearchUVA team staying nimble and highly responsive, and about the importance of using an agile software development approach to ensure a user-friendly, flexible and cost-effective solution that can continue to evolve. "Using Agile, we operate leanly so we can focus on building the system as quickly as possible with the most important priorities first. This approach helps us increase the quality of the work we deliver, makes us better able to respond to changes, and gives us more control over all aspects of the development work we are doing." The importance of the OSP/ITS CACS collaboration also generated a lot of interest, with some attendees questioning whether they'd be able to create similar partnerships within their own organizations. A lot of people were surprised to learn UVA had been managing a $1B proposal portfolio on paper until just a couple of years ago. They were also curious to see some of the reported metrics about the system. "We know how important it is to report on the outcomes of systems like ResearchUVA so that people can see a clear line of sight from program investment to organizational benefit. We are working to develop a more formal framework for measurement and our discussions in Richmond underlined that this is a hot-button issue, statewide, for institutions implementing big higher-ed projects."